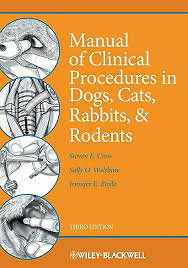 Manual of Clinical Procedures in Dogs, Cats, Rabbits, and Rodents is the third edition of this esteemed veterinary medicine classic. The Third Edition offers readers expanded coverage of small exotic mammals such as gerbils, hamsters, and guinea pigs, alongside a thorough revision of the common procedures for dogs, cats, and rabbits. Organized in the same user-friendly format of earlier editions, the Manual i s an essential purchase for small and exotic animal veterinarians and veterinary technicians.